Santa Barbara has had a long history with Spain. The Spanish first came to Santa Barbara in the 18th century. Santa Barbara then became a part of Mexico following the Mexican War of Independence and then part of the United States in 1848 following the Mexican-American War. Santa Barbara was destroyed by earthquakes in 1812 and again in 1925 and when the city was rebuilt, it was modeled after the Spanish Colonial style. Santa Barbara’s newest restaurant is a love letter to the history of Santa Barbara. Loquita, which means “wild young girl”, is the newest project from ACME Hospitality who own Les Marchands Wine Bar, The Lark, Lucky Penny, Santa Barbara Wine Collective, Helena Avenue Bakery and Notary Public Wines, all located in the Funk Zone. Loquita is conveniently located at the entrance to the Funk Zone, across the street from the train station in the downtown Waterfront District. As you walk into Loquita, under the hand-forged iron awnings, you will begin to see the melding of Old Spanish Santa Barbara with the style of today. An long walnut bar lines one side of the restaurant and another stand-up counter flanked by white columns separates the bar from the dining room. Along the back of the restaurant is an open kitchen that is framed by a white brick-framed picture window. From the walnut dining tables and mid-century modern wooden chairs to the antique mirrors, hand-carved wood frames and the vintage brass light fixtures warmed with white globe glass shades, the restaurant invites you in. Outside is a lovely white stucco patio with wood tables and vintage wrought-iron chairs. Illuminated by string lights, the patio is filled with jacaranda and cassia trees, bougainvillea, succulents, palms and flowering vines. There is a cozy fire pit and a large dual fireplace, and if you look carefully, you will see that they are both tiled in re-purposed sardine tins, honoring the Spanish tradition of preserved foods. Before heading to our seat on the patio, we stopped at the bar for a cocktail. 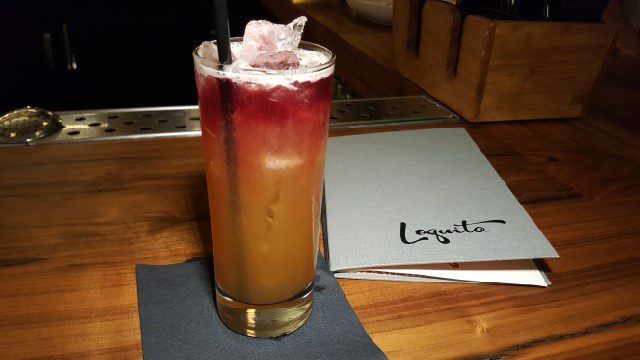 The Loquita’s cocktail list features a selection of Spanish vermouths, farmers’ market Sangria, and hand-crafted cocktails which include the famous gin-and-tonics of Spain. I enjoyed La Ribera Sour made with Rittenhouse rye, lemon and Lucano Amaro. It was the perfect rich yet tart drink to start the night. As we moved to our table on the patio, we switched to wine. The wine list is almost entirely Spanish wines, although there are some local wines on the menu as well. We started with a glass of the 2015 Uriando Bizkaiko Txakolina (Hondarribi Zuri) and the 2014 Rafael Palacios “Louro”, Valdeorras (Godello) as we enjoyed a few pintxos – remolacha (gold beet, grapefruit, gorratxa) and datil (da vall farms honey date, valdeon, cantimpalo chorizo). 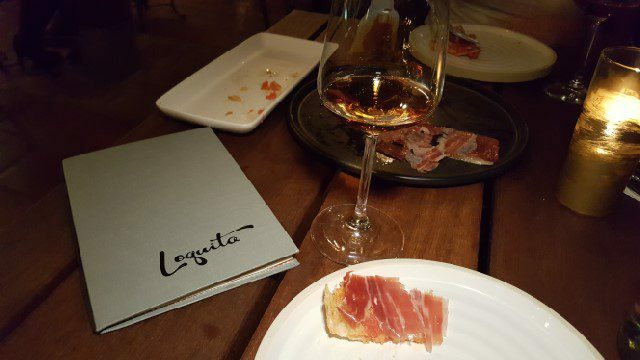 The menu at Loquita showcases the food and culture of Spain interpreted with a contemporary California sensibility. Executive Chef Peter Lee, who previously worked at Jöel Robuchon in Las Vegas and Gusto and Osteria Mozza in Los Angeles and his Sous Chef, and girlfriend, Felicia Medina, who worked at Jaléo by Chef José Andrés’ in Las Vegas, have crafted a menu that showcases the Mediterranean flavors. 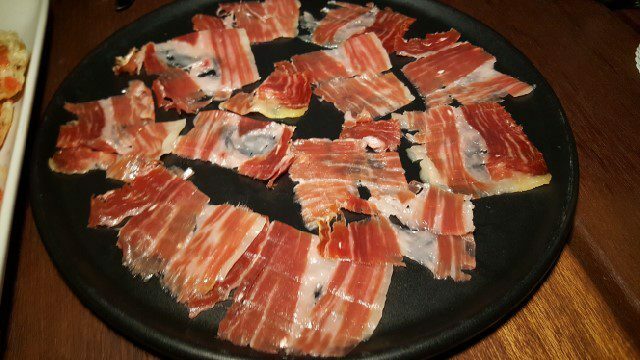 We then ordered the Bellota from the CHARCUTERIA Y QUESOS section: a large plate of thinly sliced jamon ibérico de bellota, the finest type of jamon. It comes from free-range pigs that roam oak forests (called dehesas) along the border between Spain and Portugal, who eat only acorns (bellota). Cured for 36 months, the jamon has a slight sweetness to it. 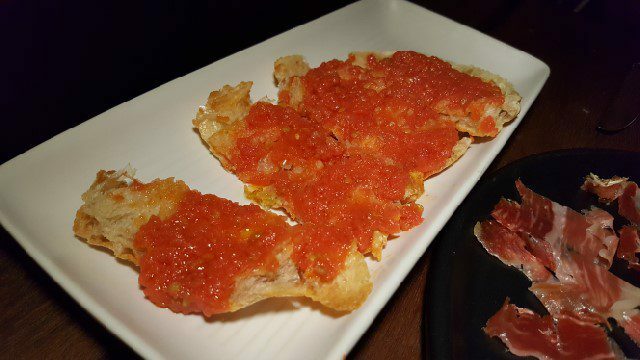 The jamon is served with Pan con Tomate (pan de cristal, tomato fresco and arbequina oil) and you can place slices of jamon on top of the bread or just eat it alone. We paired this with a glass of Lustau “Los Arcos” Amontillado Sherry. Dry with hints of wood, nuts and smoky raisins, it really brought out the nutty sweetness of the meat. The Loquita menu offers almost twenty different tapas, or small plates. We selected five to try and enjoyed them with the 2015 Bernabeleva “Camino de Navaherreros”, Vinos de Madrid (Garnacha). Tortilla Espanola – The typical Spanish tortilla Espanola is a potato omelet that is dense enough that you can pick it up with your hands. 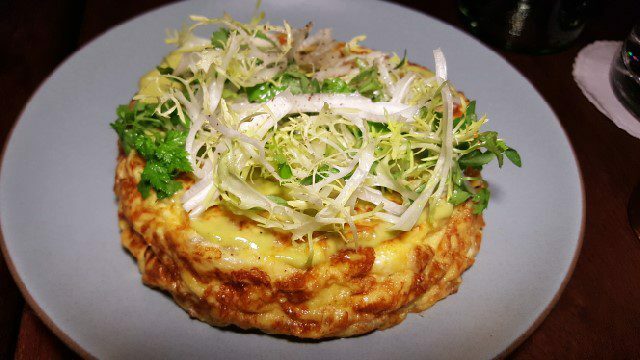 However, at Loquita, the Spanish omelet with potato, onion, herb and aioli, must be eaten with a fork. It is cooked like the perfect omelet with the egg delicate and creamy and nice sized chunks of potato. This dish is a must try! 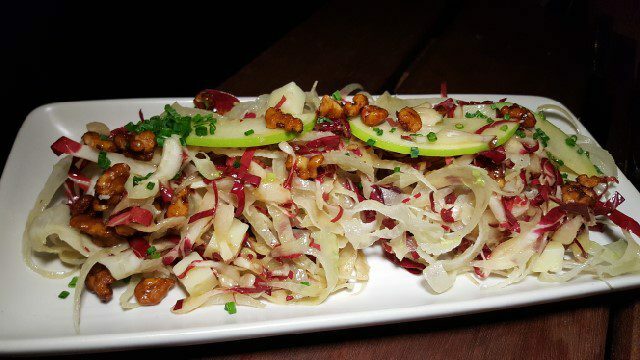 Hinojo – The hinojo is a salad of fennel, apple, manchego, walnut, honey mustard vin and radicchio. The radicchio is bitter, the apple is tart, the dressing is sweet and the walnuts add earthiness. This salad has so many flavors going on but they all work together for a refreshing salad. 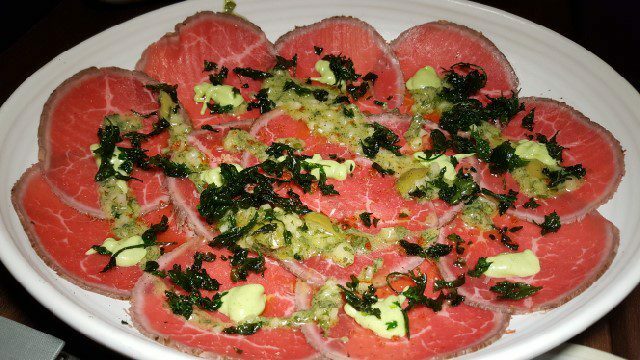 Carpaccio de Carne – A large plate of thinly sliced Wagyu beef topped with manzanilla, pickled mustard seeds, jerez sherry and parsley, this dish is delicate and melts in the mouth. 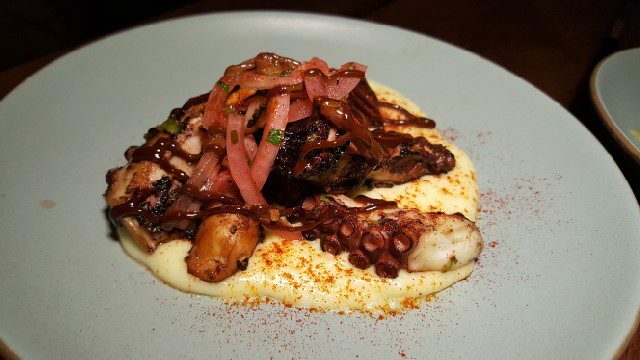 Pulpo – The Spanish octopus with black garlic aioli, potato and pickled red onion comes from the wood fire grill. I really liked the sweetness of the red onions with the tender octopus. 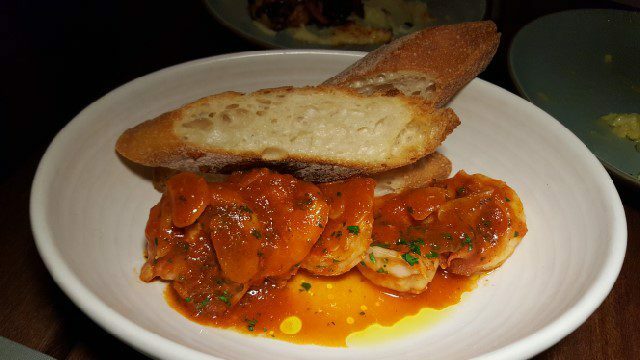 Gambas Al Ajillo – Also from the wood grill, the shrimp with tomato, brandy and garlic is served with a baguette from Helena Ave. I have ordered gambas al ajillo in many other restaurants but the freshness and brightness of the tomato really sets this dish apart. Loquita is known for their prepared-to-order traditional paella. Unfortunately, we filled up on the tapas and as we were only two people, we did not have any room for paella. But, that just means that I have an excuse to head back to Loquita! We did however, have room for dessert and chose the Pan Con Chocolate. Pan con chocolate is traditionally bread with chocolate. 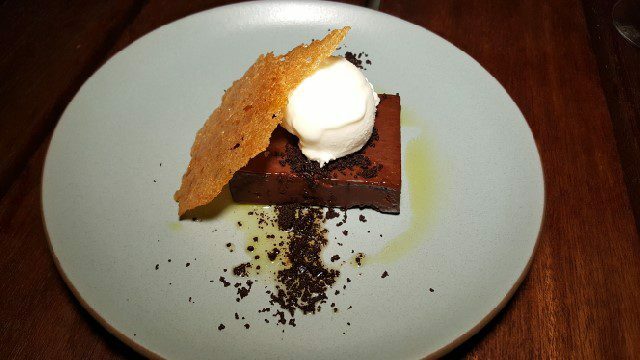 Loquita’s interpretation of this dish is chocolate and sourdough ice cream with chocolate crumble and caramelized bread. It was a perfecting ending to the meal. Open for dinner seven nights a week, General Manager Skyler Gamble and his team at Loquita will take good care of you. Buen provecho! This entry was posted in Cocktails, Food, Wine and tagged Cocktails, Executive Chef Peter Lee, Felicia Medina, food, Loquita, restaurant, Santa Barbara, Skyler Gamble, Spanish food, Spanish tortilla, Wine by Allison Levine.